For many years now, my daughter and I have celebrated a Passover Seder in our home. 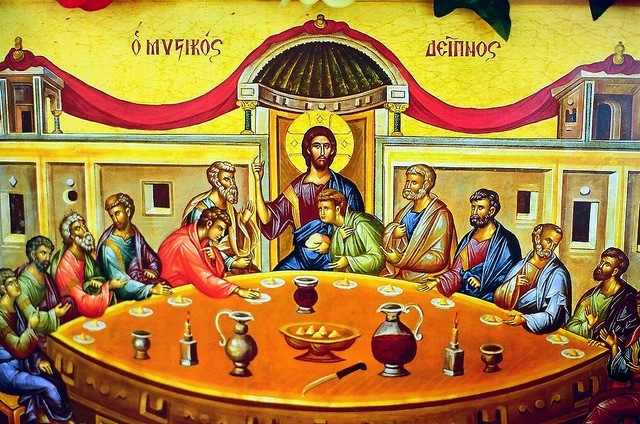 It is a tradition in many Catholic churches to put on a recreation of the Last Supper on the Thursday before Good Friday including re-enacting the washing of the feet and celebrating the Eucharist by breaking bread and sharing wine. 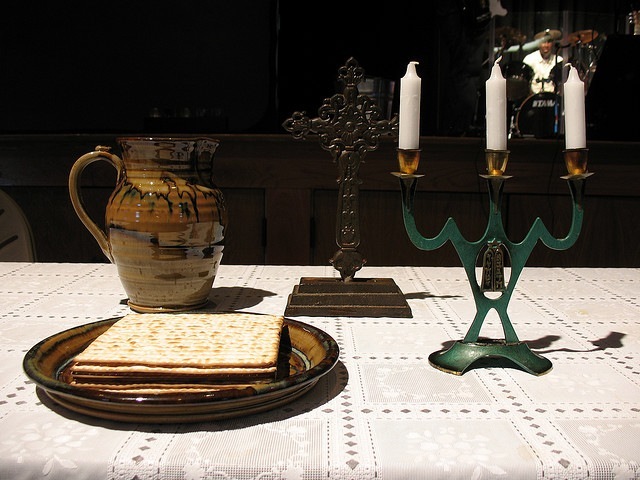 Some churches or in some people’s homes they have extended that celebration to include the sharing of a meal that would reflect one similar to what Jesus and his followers would have eaten at the time. For Jewish people, at Passover a Seder is held. The word Seder means “order or arrangement” and it is a ritual feast held to celebrate the Israelites being freed from Egyptian slavery. The Seder involves the retelling of this story (as found in the book of Exodus in the Bible) with the use of foods symbolic to the events and emotions related to it. So, in our home, we have made it a tradition to make our meal on Maundy Thursday a Seder. I have been asked by other Christians why we hold a Seder when it is considered a Jewish holiday. There are two basic reasons for it. One is that Christians and Jews have a shared history so it is appropriate that we honour those events in our history. Secondly, Jesus himself was a Jew and on the night before he died, he was indeed celebrating a Passover Seder, so again it seems very appropriate that when we commemorate Holy Week, we also take part in one. Our centrepiece is a Crown of Thorns wreath that I made. I used a grapevine wreath and put some nails in it, secured with the vines and sticking out to resemble the crown as well as to symbolize the nails that were used on the cross. I put candles into the wreath – in my classroom as well as at home, I often used this wreath every week during Lent for devotions, much as you would an Advent wreath, so I would put one candle in for each week of Lent. Another idea is to use 12 candles, one for each of the Apostles (I place the candle with the cross of cloves in it as the centre candle to symbolize Jesus). Also on the table is a bowl of water, a hand towel, a plate containing three pieces of unleavened bread wrapped in a white napkin, and a bowl of salt water (or you can put small individual bowls of salt water at each person’s place. For the unleavened bread, matzoh is traditional but certainly you can use pita bread instead as in some regions matzoh can be difficult to find. We make our own unleavened bread. At each place setting, there needs to be a glass of wine (or white grape juice) and on each plate you need: a sprig of parsley (or we substitute a small piece of celery or romaine lettuce), 1 tsp. of horseradish, 1 T. of haroset (check out my daughter’s yummy haroset recipe), a small piece of lamb (Or use one lamb shank bone as a symbol for the whole table. This is more traditional here), and a hard boiled egg (a roasted egg is traditional). We begin by lighting the candles. We welcome the participants to the table and offer up a prayer of thanks to God. Next, each person takes 4 sips of wine and we explain that each sip is to remind us of one of the 4 promises that God made to Moses to save the Israelites. 1) He promised to bring them out of Egypt. 2) He promised to free them from slavery. 3) He promised to save them by His own hand. 4) He promised that He was their God. We do a symbolic cleansing of our hands representative of not only clean hands but a clean heart as we prepare to take part in this Seder. In our home, this is done using the bowl of water and hand towel, with each person washing the hands of the person next to them to commemorate Jesus washing the feet of His disciples at the Last Supper. Now, each person takes their sprig of parsley and dips it into the bowl of salt water prior to eating it. The parsley, being a green leafy plant, stands for the new growth and new life of spring. The salt water represents the saltiness of tears, the tears of slavery but for us, it also stands for the tears of sin. In a traditional Seder, there is the asking of the four questions. This is usually done by the youngest child in attendance and is a way not only to include them fully in the celebration but also to share the story of Passover and offer up to everyone a reminder of what some of the key components of the Seder are meant to symbolize. 1) On any other night, we eat either unleavened or leavened bread, why on this night do we eat only leavened bread? 2) On any other night, we eat any kind of vegetables, why on this night do we eat only bitter ones? 3) On any other night, we don’t dip our vegetables even once, why on this night do we dip them twice? 4) On any other night, we sit in our usual seats, why on this night do we recline on cushions? 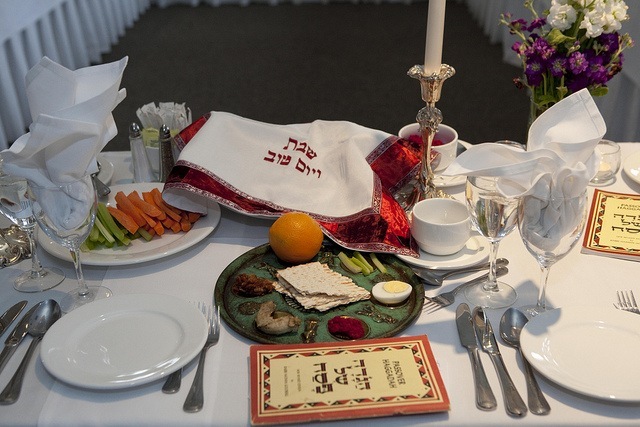 As we answer the questions, we use the corresponding items on our Seder plates. 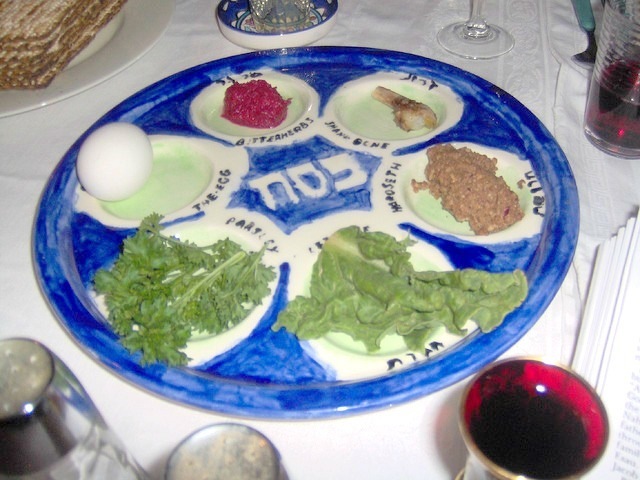 (Note: in some traditions, they use one large Seder plate and then pass around each item instead of having plates of Seder items already at each place setting). 1) We eat unleavened bread in memory of the fact that the Israelites had to escape from Egypt so quickly that they didn’t have time to allow their bread to rise and had to use it in its unleavened state. Some Christians believe that yeast or leaven has been show at times in the Scriptures to represent sin and so since this bread is without leaven, it is pure and representative of Jesus. The three pieces that we have wrapped up the cloth, we say are to symbolize the Holy Trinity while the cloth makes us think of the shroud that Jesus was wrapped in. A piece of bread is taken from the cloth and is held up for everyone to see. There are lines on the bread and holes in it reminding us of how Jesus’ body bore the stripes of having his body scourged and the holes made by the piercing of the sword and nails. One piece of bread is then broken into 2 pieces. We say that this reminds us of how Jesus was beaten and suffered prior to his death. This is the bread of suffering of the Israelites and so it symbolizes the suffering of Jesus. One half of the bread (known as the Afikomen) is wrapped again as Jesus’ body was wrapped before burial and when the children aren’t looking, it is hidden for them to go hunting for later. It has been hidden from sight just as Jesus’ body was temporarily hidden when it was buried in the tomb but just as Jesus reappeared to us, so the children will find the Afikomen and it will reappear to us again as well. 2) On this night, we eat only bitter vegetables to remind us of how bitter life was for the Israelites living in slavery in Egypt. Hold up some horseradish (known as maror) and say “…the Egyptians became afraid of the Israelite slaves and made them work even more. They made their lives bitter with hard work making brick and mortar and doing all kinds of work in the fields.” (Ex.1:12-14) Share some of the bread with those present and have them scoop a little horseradish onto it and eat it. 3) On this night, we dip our vegetables not once but twice. We have already dipped the parsley into the salt water. Now we use the haroset which represents the bricks and mortar the Israelites toiled over for the Pharaoh. We once again scoop some maror onto a piece of bread but this time we dip it into the haroset as well. This reminds us that along with the bitterness of life, with God’s love, we also experience the sweet. When bad things happen to us, we can sweeten them with the hope of God’s everlasting love. 4) Usually we eat our meals in regular chairs but tonight we recline on soft cushions. The Israelites had to eat quickly and return to their work as slaves in Egypt. Then when making their escape, again they had to eat quickly, sandals on, walking sticks at the ready so that they could leave at a moment’s notice as needed in order to flee their Egyptian oppressors. Reclining on the cushions reminds us that they and we can now eat a leisurely meal while relaxing. This is the time to share the story of Moses’ life, including the plagues, and the exodus. (Draw from Exodus 2-14). The lamb (or lamb shank) stands for the lamb’s blood marked on the Israelites’ doors as a sign to God. God told Moses, “The lamb must be perfect” and when it is killed, “the people are to mark their door frames with some of the blood… They are to eat the meat that night, along with bitter herbs and unleavened bread. Eat quickly, with your coat ready, your shoes on your feet, and your walking stick in your hand. It is the Lord’s Passover. The blood will show your obedience; when I see the blood, I will pass over you and no plague will touch you when I punish Egypt.” (Ex.12:3-13) Of course to Christians, we see the lamb as symbolic of Jesus as Lamb of God as well. Note: some choose to serve and eat lamb as the representation here while others feel it’s better to merely use the shank bone to show that it’s no longer necessary to sacrifice lambs and eat them at Passover because Jesus is now the sacrificial lamb. Now we eat the egg. The egg is called Hagigah – a name indicating it as a traditional offering that was brought to the Temple on Feast Days. The hardness of the shell reminds us of the hardness of Pharaoh’s heart as well as of everyone who is without love in their hearts. The egg inside is a sign of new life – when we break through the hardness of the shell we can experience new life with God. It’s rounded shape, having no beginning and no end, signifies the eternal and everlasting life we can have with God. Dayenu – This means “It would have been enough.” A series of statements are made about something that God has done for His people and the reply is “dayenu (it would have been enough)”, showing that if God had simply done just one thing for us, it would have been enough but He just kept on doing more and more. Examples of such statements can be: If God had only destroyed our enemies but had not led us to food in the desert…”. A variety of these statements can be said with the attendees responding with dayenu/it would have been enough. Often in Jewish Passover celebrations the dayenu is sung. The wine glasses are now filled for a second time and we drink from them, the cup of joy. Although we have partaken of a symbolic meal for the Seder, now is when we indulge in an actual full meal enjoying our time together as family and friends. After the meal, it’s time for the children to go searching for the Afikomen (the hidden piece of unleavened bread). Usually the child who finds it is given a little prize such as some pieces of gelt (chocolate coins). In our Christian adaptation of a Seder, the retrieved piece of bread is broken, referring to the words Jesus said at the Last Supper, “Take this bread and eat it. This is my Body given for you; do this in remembrance of me.” The bread is passed around and shared by all those present. We go on by lifting up the empty cup that was set at Elijah’s place at the table. This cup reminds us of Elijah’s constant presence at our table and in our lives. We fill this cup with wine for Elijah and open the door to invite him in. Elijah’s cup of wine and the empty chair also helps us to remember those who still cannot celebrate in freedom. Our wine glasses are filled one last time again and this time we drink from them to give thanks and praise to God. Wow! What an incredible article, Cyn. Next year I’m coming to YOUR Seder!